The good ol’ “Food Pyramid”, aka “My Plate” now, tells us that brown triangle as the ideal amount of grains to consume each day, coupled with the green triangle which could be corn, potatoes, and other starchy veggies, AND the red triangle of fruits…all three colors are carbohydrates…holy moley! If we follow what the USDA wants us to eat………wait – there’s the little blue circle in the upper left corner – that’s gotta be an ice cold glass of milk represented there, right? And what do we have there? Some protein, maybe some fat, but more carbs. Our poor little purple triangle, the smallest on the plate doesn’t stand a chance! If we keep eating like this, we’re going to LOOK like pyramids! f we keep eating like this, we’re going to LOOK like pyramids! If you look at the top two examples, grains in orange (coupled with the “beans” addition to the meat group in the pyramid – geez! ), it’s evident that someone thinks we should eat grains as a part of a healthy daily diet. But there’s a problem with this…a BIG problem with this. Details below, but in addition to the facts, the the real question is why we even believe it. Seriously, take grains, dairy, legumes and sugar out of your diet for 30 days and then reintroduce grains. A majority of people notice their guts will ache, and they’ll bloat…symptoms that your body is rejecting that food. So why do we believe it? Below is a thought provoking graphic describing a scenario which is much like what we deal with in trying to eat a truly health-promoting diet as opposed to what we’re told is healthy by the FDA and mainstream nutritional advice. You’ll have to click on it to see it. Monkey say, monkey do, right? Yes – I said monkey “say”. They say it, we believe it. Ask why – always ask why! This is why when someone tells me they’re trying a new supplement, I ask why. Why can’t you get it from your diet? And if you’re deficient in it, did you look at where your diet might be lacking before you start with supplementation? You should be educated and studied on what you’re doing and what you put inside your body. 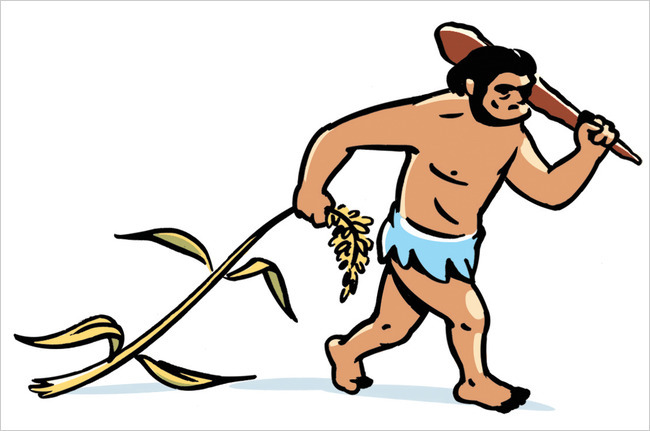 Now, if you’re following a primal-ish diet (enough protein to support training, high quantities of non-starchy vegetables, enough carbs -which might include some safer grains like white rice, oatmeal, quinoa- plus potatoes…healthy fats), you’re definitely working against the grain! It might be your family, friends, spouse, coworkers or all of the above, but you can tell, right? They think you’re “limiting yourself”, or starving yourself, or not getting enough fiber because you don’t eat grains or calcium because you don’t do dairy, right? I’ve been there… Don’t get me wrong, for 4 or 5 years now I’ve tried to impart my opinion of a good diet on my family, but speaking from experience and from hearing a lot of really smart people talk about their “elevator pitch”, don’t force it. Believe what you believe and do what you think is right, and if people are going to follow you, they’ll do it because they see your results, not because you told them to do it. You guys have seen this, right? It’s on the wall in RebelHealth. I like bullets. This is pretty straight forward, but in order to understand it fully, you might have to do a little Dr. Googling. Instead of rehashing all the grain mumbo jumbo, I’m just going to give you links to our past post on grains, as well as some other websites and blogs that have great data and writings on grains. These are some of the best written explanations I’ve seen. It takes some getting used to, but in the long run, what you’re getting rid of is more than grains, it’s inflammation, gut permeability, autoimmune disease, and a whole slew of other potential health problems. What you’re gaining is health, leanness, performance and longevity. This entry was posted on Sunday, November 12th, 2017 at 4:30 AM	and is filed under RebelHealth. You can follow any responses to this entry through the RSS 2.0 feed. You can leave a response, or trackback from your own site.